Many years ago, while attending a presentation on the topic of personal performance, the speaker said something I’ve never forgotten, “Leadership is the art of initiating a conversation that goes on without you.” Something about that statement resonated with me. And, I’ve been sharing that idea with parents ever since. When it comes to talking to your daughter about personal safety, starting a dialogue and sharing good information that will “stick” is key to helping her develop smart habits. Engaging her in ongoing safety talks is crucial because the inescapable truth is, when she heads off to college or even a night out with friends, you won’t be there to watch over her. Launching these kinds of conversations, however, can be tricky. Many parents, for example, take a deep breath and jump straight into the “big safety talk,” just before their daughter leaves for college. This approach, however, is rarely effective. Weighty conversations like these can feel overwhelming for young women– especially when they already have a lot on their minds. Even more problematic, almost every “big talk” is quickly forgotten. It’s simply too much information to take in all at once. So what’s the best way? 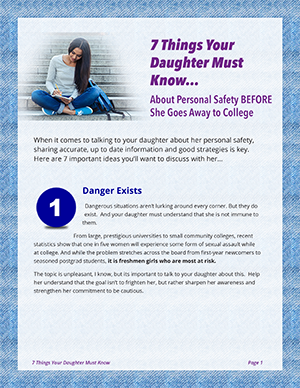 How can you communicate with your daughter more effectively about personal safety? Much like getting in shape and staying fit, it’s all about small bouts and repetition, spread out over time. Every day presents opportunities to engage her in conversations about handling uncomfortable, even potentially dangerous situations. You’re already talking with her about school, her friends, and family activities. Why not throw personal safety and self-defense into the mix? And while I don’t recommend these conversations on a daily basis, they should happen at least once or twice a month to be effective. When conversations about her safety are approached as regular, informal chats — rather than serious sit-downs -– they become less scary and awkward; they are more gently absorbed; and most important, they are remembered. While a single conversation may be quickly forgotten (no matter how much importance you place on it), repeated, casual safety talks with your daughter will help her build strong habits that last. Now, instead of having personal safety become a topic that she pretends doesn’t exist, she’ll grow up conscious of the dangers she may face and aware of the strategies she can use to deal with them. Remember, talking with your daughter about navigating dangerous situations is never easy. But, it doesn’t have to be something you both dread. Initiating these “little talks” and continuing them throughout her teen years will make her safer, build her confidence, and help you sleep better knowing that even when you’re not there, the conversation you started will go on without you. This entry was posted in Safe Living on May 14, 2015 by Brad Michaels.